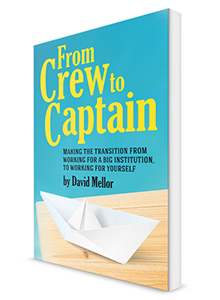 The purpose of “From Crew to Captain” is to help people understand the transition from working for a big institution to working for themselves. I have made this journey, and helped many others do the same. I want to put the odds in your favour, if you decide to follow suit, that your business venture brings you everything you wish, and that you prosper rather than merely survive. You will find inside my book a number of practical tips and hints, all garnered from the “University of Life”. “From Crew to Captain” draws on a broad range of interview material from people who have made or are making this journey, and for whom success has looked very different. It also draws on a wealth of anecdotal evidence from my own experience and that of others. “From Crew to Captain: A Privateer’s Tale” will be published in September 2014. The book has been written for new and experienced consultants with updated case studies, expert content, ideas and inspiration to help you succeed. This book will be particularly helpful if you are setting up as a sole practitioner consultant or equivalent, after leaving a big institution. “From Crew to Captain: Commander of the Fleet” in 2015, which will address generic growing pains, building on an established business model and achieving sustainable profitable growth – with a special feature on building from sole practitioner to a consultancy practice.